Hezekiah's Wall (left) as it passes over earlier Canaanite wall above the Rock-Cut Pool. "Then said the Lord unto Isaiah, Go forth now to meet Ahaz, thou, and Shearjashub thy son, at the end of the conduit of the upper pool in the highway of the fuller's field..." (Isaiah 7:3). This meeting between Isaiah and Ahaz took place before Hezekiah became king and before Hezekiah "made a pool, and a conduit, and brought water into the city... (Isaiah 20:20). 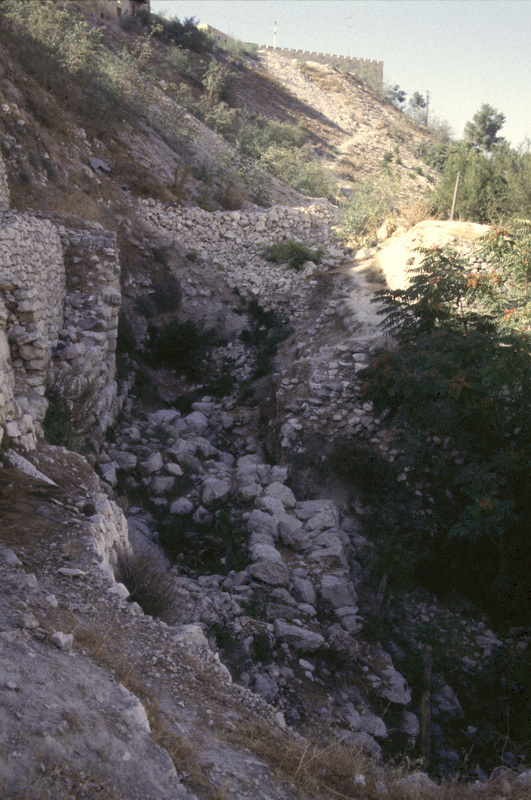 Therefore the "conduit", referred to in Isaiah 7:3, represents the Siloam Channel (Channel II) and the "upper pool" represents the ancient Rock-Cut Pool located near the Gihon Spring. Later, the Assyrians would come to this same spot and call to king Hezekiah. Eliakim (who was over the household) came out to them (II Kings 18:17, 18). This indicates that the house of the king was nearby. Archaeologist Eilat Mazar has uncovered evidence of a palace or castle on top of the ridge above the spring. (Amihai Mazar, The Quest For The Historical Israel,​ The Search For David And Solomon: An Archaeological Perspective, 2007, p. 127). Along the ancient trail between Jericho and the Mediterranean Sea lies the city of Jerusalem. People settled there after discovering the Gihon Spring in the Kidron Valley. In 1984, while excavating pits in the bedrock near the spring, we found flint tools and ceramic sherds from the Chalcolithic Period (ca. 3200 BC). The first mention of Jerusalem in the Bible refers to "Salem" and relates an incident that occurred about a thousand years after the Chalcolithic period . Genesis 14: 18 says, “And Melchizedek, king of Salem (Jerusalem) brought forth bread and wine: and he was the priest of the Most High God.” He blessed Abram in verse 19, and in verse 20 Abram gave him tithes. Abram (Abraham) lived in the Middle Bronze Age (ca. 2166-1991 BC). Soon after the departure of Melchizedek, the Canaananites inhabited the city and constructed a large complex water system that secured their supply of water. A conduit was cut into the bedrock (Channel II) which channeled the water southward, watering crops in the Kidron Valley on its way to a pool just outside the city. Some of the water was channeled (Channel III) into a large, rock-cut, pool (later known as the upper pool). Using huge blocks of masonry, some nearly 6 feet long, 3 feet high, 3 feet deep, and weighing 4 to 5 tons, they built a tower over the spring and channel. This tower, which measured 45' x 55' had walls that were over 12 feet thick. The Canaananites constructed a long passageway just west of the spring using cyclopian stones like those used in the Spring Tower and this passageway led up the slope to the Water Gate. This gate was the main entrance to the city in the Middle Bronze Age II (18th-17th century BC) and was incorporated into the mid-slope wall that ran along the eastern side of their 10 acre city. The Bible seems to describe this area in Deuteronomy 8: 7 where it says, "For the Lord thy God bringeth thee into a good land, a land of brooks of water, of fountains and depths that spring out of valleys and hills..." In Deuteronomy 12: 10 it says, "But when ye go over Jordan, (c.1400 BC) and dwell in the land which the Lord giveth you to inherit, and when he giveth you rest from all your enemies round about, so that ye dwell in safety; 11 Then there shall be a place the Lord your God shall choose to cause his name to dwell there..."
As the Israelites entered the promised land, they had an opportunity to take Jerusalem from the Jebusites, who by then had occupied the city, but failed to do so. Judges 1: 8 " Now the children of Judah had fought against Jerusalem, and had taken it, and smitten it with the edge of the sword, and set the city on fire." Judges 1: 21 "And the children of Benjamin did not drive out the Jebusites that inhabited Jerusalem; but the Jebusites dwell with the children of Benjamin in Jerusalem unto this day." Joshua 16: 63 also says, "As for the Jebusites the inhabitants of Jerusalem, the children of Judah could not drive them out: but the Jebusites dwell with the children of Judah at Jerusalem unto this day." It wasn't untill after David was made King (c.1000 BC) that the Jebusites would finally be defeated. When David came to Jebus (Jerusalem), he said that the first soldier to enter into the city through the water system would become captain of his army: "Whosoever getteth up to the gutter, and smiteth the Jebusites... he shall be chief and captain" (II Samuel 5: 8). "So Joab... went first up, and was chief" (I Chronicles 11: 6). Kathleen Kenyon uncovered a 40 foot stretch of a thick city wall along the middle of the eastern slope. The wall was dated by examination of the potsherds found in the foundation trench and it dated to Middle Bronze II (Kathleen Kenyon, Digging Up Jerusalem, 1974, p. 81). Yigal Shiloh excavated a 240 foot stretch of this same wall (in his area E), and he also dated the wall to Middle Bronze II (Yigal Shiloh, QEDEM 19, Excavations at the City Of David I, 1984, p. 26). The Jebusites, who lived on top of the ridge, had constructed a secret tunnel that led from an opening behind the protection of the mid-slope wall down to their rock-cut pool below. It is possible that Joab somehow got into channel II and, once finding the upper pool, simply followed the tunnel which led him and his men into the city above. In Isaiah 7: 3 the Lord tells Isaiah, (before Hezekiah's time) to meet King Ahaz, “at the end of the conduit of the upper pool in the highway of the fuller’s field". The "conduit" here is the ancient channel that runs southward from the spring and the meeting place is at the northern "end" of it.. In II Kings 18: 17 (with Hezekiah now king) it says, “And the king of Assyria sent Tartan and Rabsaris and Rabshakeh from Lachish to king Hezekiah with a great host against Jerusalem. And they went up and came to Jerusalem. And when they were come up, they came and stood by the conduit of the upper pool, which is in the highway of the fullers field.” The next verse places their location near to the king's house, "And when they had called to the king, there came out to them Eliakim the son of Hilkiah, which was over the household... (archaeologist Eilat Mazar has located the palace on top of the ridge above the Gihon Spring). The “conduit of the upper pool” mentioned in Isaiah 18: 17 is clearly referring to the same location as Isaiah 7: 3 but it is interesting that, by this time, Hezekiah may have been working on his tunnel to bring the water to the west side of the city and to hide it from the Assyrians (II Chronicles 32: 30). The Assyrians left without conquering Jerusalem but it wasn’t long before the Babylonians conquered it in 586 BC. After seventy years in captivity the Jews were allowed to return to Jerusalem and, under Zerubbabel, Ezra and Nehemiah, the Temple and city walls were rebuilt. Nehemiah, when inspecting the damage (Neh. 2: 13-15), moves eastward from the Valley Gate to the Dung Gate, northward to the Fountain Gate and on to the Kings Pool by the brook. The King’s Pool mentioned here would have been the upper pool, which had been reworked by King Hezekiah near the Gihon Spring. Nehemiah, when repairing the damage done by the Babylonians, (Neh. 3:15), refers to the Pool of Siloah (Siloam) by the King’s garden. The Pool of Siloah mentioned here would have been the lower pool, which was down by the king’s garden at the southern end of the city. We can say with some certainty that references to the upper pool, old pool, or the King’s pool all speak of the pool that is adjacent to the Gihon Spring. All references to the lower pool or Pool of Siloam speak of the pool which is adjacent to the King’s garden. Archaeologists Ronny Reich and Eli Shukron claim that debris in the Rock-Cut Pool (dating to around 800 BC) shows that "Hezekiah's Tunnel" was dug before Hezekiah's time (TEL AVIV Vol. 38, 2011, The Pottery Assemblage from the Rock-Cut Pool near the Gihon Spring, Alon De Groot and Atalya Fadida, 158-166). With the pool out of use, a residence was built inside it. The foundation was made level by pushing old pottery and debris from the surrounding area into the pool. The point being that the pottery and debris would certainly be from before Hezekiah's time (the builder of the residence did not break pots to make the foundation level). Reich and Shukron use this pottery to "prove" that the pool was out of use before Hezekiah's time but this older pottery proves just the opposite, that the pool went out of use during or after Hezekiah's time. The waters of the spring still flow through the tunnel that King Hezekiah dug (701 BC) through solid rock to bring the waters to the west side of the city. The Upper Pool was cut into the bedrock, more than a thousand years before by the Canaanites and was filled by the spring through a channel cut into the bedrock. 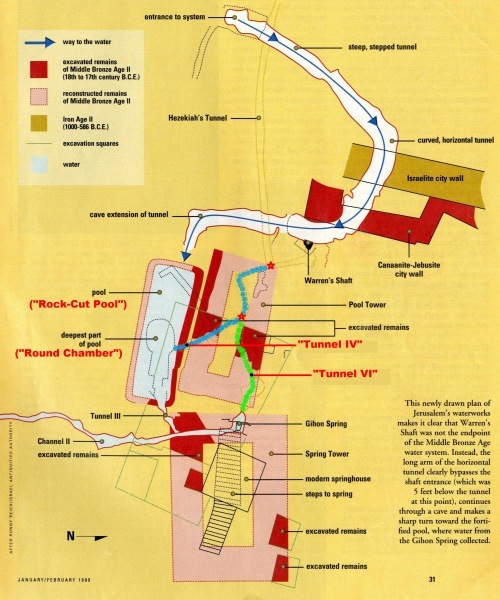 Hezekiah originally designed his tunnel to begin at the rock cut pool (tunnel IV) and end at the Siloam Pool. (Pool to Pool), (Upper Pool to Lower Pool).